You’ve heard it your whole life from mom, dad, grandma, and grandpa: “Eat your vegetables!” But grandma didn’t have the advantage of instant access to thousands of recipes for veggies trending online. There was no such thing as “veggies gone viral” in her day. Eating veggies often meant plowing through a pile of potatoes, noshing on fresh corn on the cob, or sopping up some baked beans. So what do you get when you combine the age-old request to “eat your vegetables” with a veggie dish trending on social media? You get an empty plate! It’s really that good. 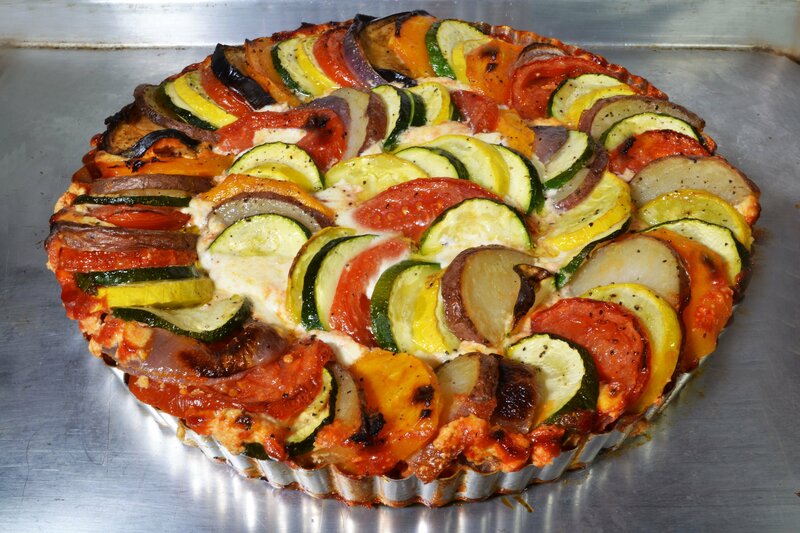 The Rainbow Veggie Round combines any and all of your favorite, in-season produce, sliced in rounds and placed pinwheel-style in a pie dish with a layer of tomato sauce and ricotta and Parmesan cheese as a base. Just about everything “rainbow” is trending these days, from bagels to waffles to multi-colored pastas. So why not veggies? I’ve offered up some of my ideas for sliced vegetables like Japanese eggplant, summer squash, and purple potatoes. Make up your own rainbow of veggies, and then serve it up as a wonderful, meatless main dish, or as a colorful and tasty side! Slice all veggies about the same size, in about 2" by ¼" thick rounds. In a 9-10" tart pan or glass pie plate, pour tomato sauce of your choice in the bottom. Dot with ricotta cheese, or, if preferred, sprinkle with parmesan cheese. Start with the outer edge. For the second row, do the same thing, but layer them in the opposite direction. For the third row inside, layer the veggies the same way as the outer row. Continue until veggie slices are used up. Drizzle with olive oil and sprinkle with salt and pepper to taste. Bake at 350ºF for about 40 minutes, or until veggies are cooked and top is slightly browned. To speed up the cooking process, you can microwave the potato slices or any other vegetable that needs more cooking time and then arrange them with the rest of the raw veggies.